When you sell grills for a living, it's good to make friends with folks that know a little something about food. That's why, when we have the opportunity to partner with companies, especially companies in the “eating” business, we jump at the chance! Gourmet Guru Grill is honored to call Eat Ya'll and Townsend Spice our friends and partners. Here's why. One of the Eat Ya'll founders, Andy Chapman, happens to love hunting, fishing, and grilling up his bounty. He discovered the Gourmet Guru Grill in 2014, we started talking, and have been close friends ever since. Chapman, a Jackson Mississippi resident, started Eat Jackson, a local restaurant review site. After this site quickly gained popularity among Jackson's foodies, Andy also founded Jackson Restaurant Week and Eat Y’all. He is also the creator behind the gourmet Sugar Taylor Sauce, something we highly recommend you try on some of that meat your grilling in your Guru! Eat Ya'll often accompanies us to trade shows and marketing events, and we are so proud to be partners with this up and coming southern company! Check out their articles, online shop, and more at EatYall.com. Townsend Spice and Supply in Melbourne, Arkansas, has been in business since 1978. They specialize in custom spice blends, and manufacture several sausage blends and fresh and smoked type sausage seasonings. It's really a unique company – they also carry casings, and everything for those do-it-yourself types that really like to do their own butchering and spice-making. Townsend also carries raw spices, and they custom blend specialty rubs for many well known restaurants including Sonny's Barbecue, Whole Hog Cafe and 17th Street Barbecue. What is so neat about Townsend is...if you want a custom rub, they will create it for you right there in the store! The Townsend Spice and Supply store building has a unique “old country store” feel to it. It's almost a tourist attraction. The spices and supplies align the walls and the smell, when you walk in, will certainly wet your appetite. If you're lucky, the guys will be grilling or making sausage when you visit, and you can try it out for yourself! Owners Shane Linn and David Blankenship are the friendliest “spicers” (is that a word? It should be!) you'll ever meet. They take pride in their business, and growing and expanding the company into household name! 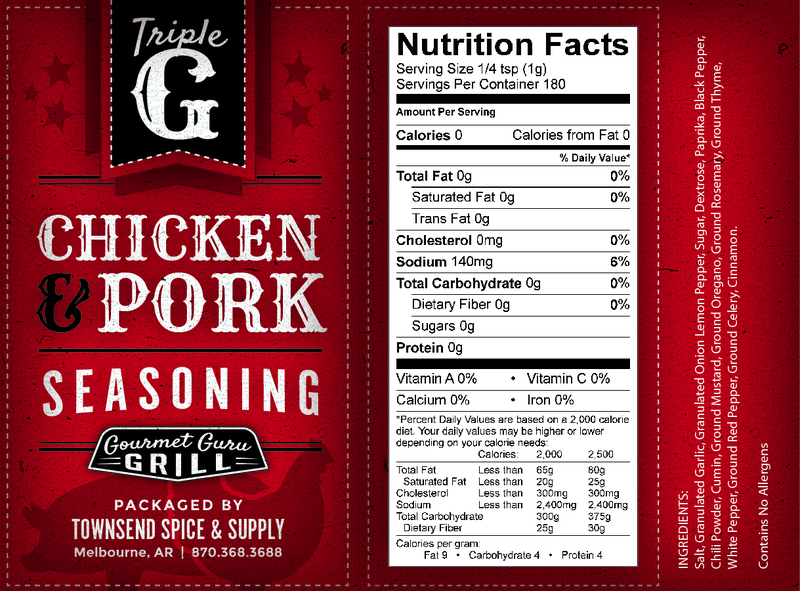 We are beyond excited to have partnered with Townsend to create our special Triple G Rub….Guru's very own secret blend of spices to perfectly season your chicken and pork. Balance that with the unique cooking experience and results of the Guru Grill and you're pretty close to perfection! Try out one of Jack's favorite recipes with the Triple G Rub from Townsend Spice and send us your feedback. We'd love a picture to post on our facebook page! PS – you can purchase the Triple G Rub on our website – a four pack for $29.99, and you can find all the Townsend Spice and Supply products as well as their unique story on townsendspice.com. We are just getting started making more friends and forming more partnerships in the food industry! Let us know if you know a company that would like to partner with Gourmet Guru Grills or you are ready to purchase your very own Guru Grill! Contact us at gourmetgurugrills.com or call 855-307-0933. Rinse chicken and pat dry. Rub down in oil. Place butter into cavity. Sprinkle seasoning generously over bird. Place chicken on pre-heated grill at 300°- 350° F until internal temperature reaches 165° F. Let stand for 5 minutes then serve.